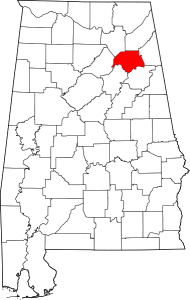 Etowah County is a county of the U.S. state of Alabama. 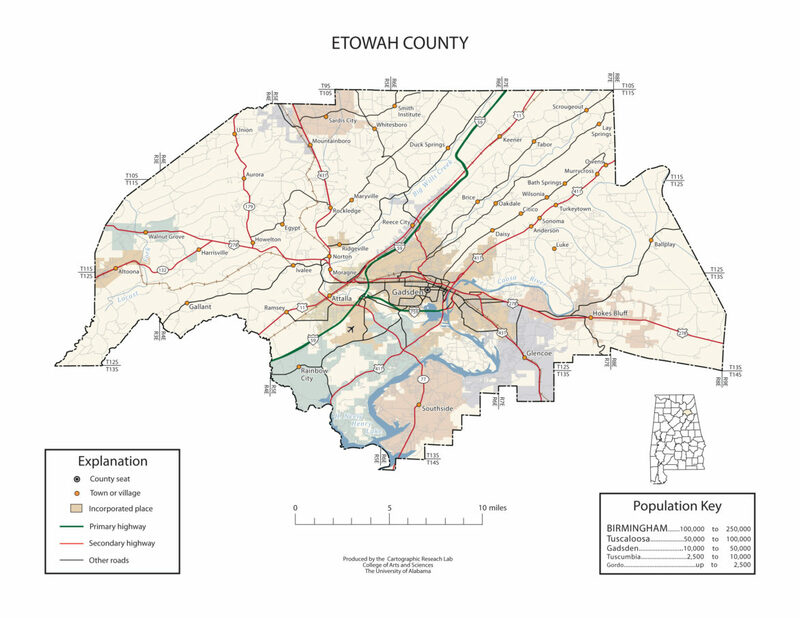 Etowah county is located in the northeastern section of the state, in the southern Appalachians. As of the 2010 census the population was 104,430. Its county seat is Gadsden. It is the smallest county in Alabama but one of the most densely populated. Its name is from a Cherokee word meaning “edible tree”. The Alabama legislature established Etowah County on December 7, 1866. The territory of Etowah County was originally split among the neighboring counties, with most of it belonging to DeKalb and Cherokee counties.In honor of the confederate soldier, General David W. Baine, Etowah County was originally named Baine County. Baine County officially became known as Etowah County on December 1, 1868. The county was abolished on 1868 Dec. 1 by the Constitutional Convention and re-established on the same day, under the name of Etowah, which is from the Cherokee language. The first settlement in what is now Etowah County was located at a town called Double Springs on the Coosa River. On May 2, 1863, during Union colonel Abel Streight’s raid through north Alabama, a local farmer named John Wisdom gained notoriety when he raced ahead of Streight’s troops, who were in turn being pursued by Confederate general Nathan Bedford Forrest, to Rome, Georgia, to warn the town’s citizens of the Union troops’ impending arrival. A young girl named Emma Sansom became a local heroine during the raid when she led Forrest and his men across Black Creek to capture Streight’s troops. In 1942, the U.S. took possession of 36,300 acres in Etowah and adjoining St. Clair County to establish Alabama’s first Chemical Warfare Center (CWC). Known as Camp Sibert, it served as a Unit Training Center and a Replacement Training Center for the CWC. Deactivated in 1945, Camp Sibert was the training site for more than 45 percent of all CWS troops who served in World War II. Attalla is a city in Etowah County, Alabama. As of the 2010 census, the population was 6,048. The town occupies the site of an Indian village which was of considerable importance during the Creek War. It was in Attalla that David Brown, a Cherokee assisted by the Rev. D. S. Butterick, prepared the Cherokee Spelling Book. Attalla was not founded until 1870, on land donated by W. C. Hammond, a plantation owner. It was incorporated as a city government on February 5, 1872. The town was officially named “Attalla” in 1893, from the Cherokee language word meaning “mountain”. Attalla is the site of the first hydroelectric dam to provide electricity for a city, constructed in 1887. In 1903, Gadsden resident William Patrick Lay built his first hydroelectric plant on Big Wills Creek, which furnished the town of Attalla with electricity. 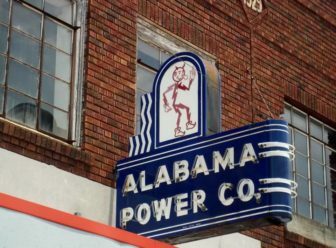 He organized Alabama Power Company in 1906. Heritage Day: Held the third Saturday in October each year. The City of Attalla and our sponsors are proud to present, Attalla Heritage Day. The festival features arts & crafts, car show, bands, food vendors and a large children’s area including free rides, games and activities. Heritage Day is a FREE fun filled family event! The festival is located in a blocked off area of downtown Attalla which includes antiques, restaurants, boutiques and professional services. 9 a.m.-4 p.m.
Gadsden is the county seat, named after Col. James Gadsden, distinguished soldier, diplomat, railroad president and famous for the Gadsden Purchase. Gadsden became an important military center during World War II, when the Gadsden Ordnance Plant was constructed to produce shells for cannons. By the end of the war in 1945, the plant had produced more than 16 million shells. Sand Mountain and Lookout Mountain are located in Etowah County. Etowah County is the starting point for the annual World’s Longest Yard Sale, a multi-state, three-day event that stretches more than 690 miles and culminates in Addison, Michigan.